What information do we collect? We collect, monitor and store the following information, which is commonly referred to as "traffic pattern" information: (1) The domain name that has accessed our Web site (for example, if you subscribe to America Online, we would know that someone from AOL has accessed our site, but we would not know which of the millions of AOL users actually accessed our Web site); (2) The date and time our Web site has been accessed; (3) The number of visits we have to our Web site; and (4) The Internet address of the last Web site displayed on your screen prior to accessing our Web site. We may collect and store your name, e-mail address, postal address, phone number and other domain-related information. You will always know when we are collecting this information, and disclosure is always voluntary. We do not trade, sell, rent, lease, or otherwise share Personal Information with outside parties. Any Personal Information that is disclosed is done so voluntarily. Occasionally we will collect names, postal addresses, phone numbers and domain-related information. We use this information for our own internal business purposes. Hacker Custom Exhaust may provide generic statistics about our traffic patterns and related site information to outside parties, but these statistics will never include Personal Information. We never use traffic pattern information to personally identify individual users. Traffic pattern information is taken and used only to generate generic statistics. These statistics are used to identify general trends concerning the use of our Web site, tell us which of our Web pages are the most popular and to help us determine how we may improve our site. Links Hacker Custom Exhaust has links on some of its Web pages that will link users to third party Web sites. Hacker Custom Exhaust is not responsible for the privacy or other policies of any third party Web sites with which it has links, or of the links offered on such third party Web sites. Please refer to the operators of such third party Web sites for information on their individual privacy policies. Security Hacker Custom Exhaust uses its best efforts to promote the security, integrity, and privacy of any Personal Information that you disclose. Unfortunately, no computer system or data transmission over the Internet can be guaranteed to be 100% secure. As a result, while Hacker Custom Exhaust strives to protect your Personal Information, Hacker Custom Exhaust cannot guarantee the security of any information you transmit to us. 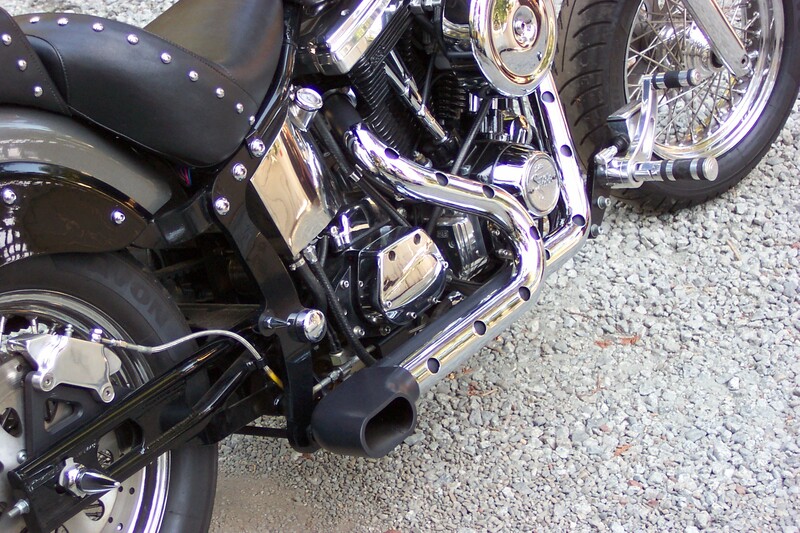 Tell Us What You Think Hacker Custom Exhaust welcomes your questions and comments about privacy. Please send e-mail to info@hackercustomexhaust.com. Harley Davidson� is the registered trademark of Harley-Davidson, Inc.
Victory� is the registered trademark of Polaris Victory, Inc.
Indian� is the registered trademark of Indian Motorcycles. Inc.
Yamaha� is the registered trademark of Yamaha Motors, Inc.
Honda � is the registered trademark of Honda Motorcycles, Inc.
Kawasaki � is the registered trademark of Kawasaki, Inc.